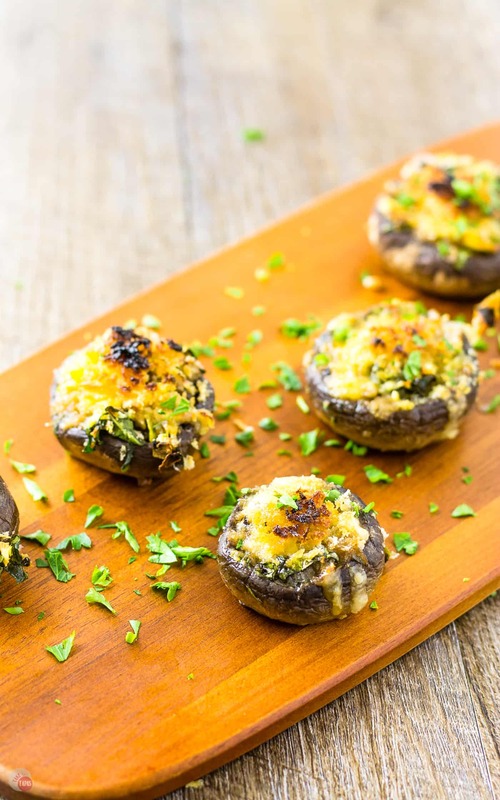 Stuffed Mushrooms are a staple party appetizer. Check out my Magnificent Stuffed Mushrooms with a few surprise ingredients! My close friends know that I have a love affair with shoes that began a few years ago thanks to my husband Brooks. For most girls, the affinity for shoes manifests itself around the time they can touch their toes. My infatuation, however, began at a MUCH later date. 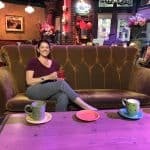 I attribute this delay to late blossoming and a tomboy upbringing that was even further postponed by a post-college occupation that only required me to wear jeans and tennis shoes. Blaming my husband for introducing me to beautiful shoes is my excuse for having a closet full of them and, believe me when I say, he is literally paying the price for that monumental mistake. You may be asking yourself what this has to do with mushrooms. Hold your horses speedy; I’m getting there! Be open-minded when I tell you that I think of mushrooms as the high heels of the food world. When I see a pair of stunningly glamorous, sky-high stilettos I start to drool, much the way I do when I smell mushrooms delicately simmering in a warm bath of butter and wine. Just as shoes complete the outfit, mushrooms add a depth and complexity unlike any other to the dish in which they are added to, making it hard to think of it without them. Their earthiness rounds out even the most one-dimensional entrée and turns it into an ensemble of flavor. On the flip side, mushrooms are also like those beautiful suede platforms that look great on the rack and then turn into shackles of pain within 10 minutes of putting them on. That’s right! I like the flavor of mushrooms but do not like to feel them in my mouth. Their texture does not sit well with me (it must be a psychological barrier I use to block out a horrific previous encounter). Unfortunately for me, my husband, and probably most of the earth’s population, like mushrooms. I even garnered enough courage to eat one myself. Believe it or not, I liked them. I know that if I liked them, you certainly will too. I even used this recipe for the Magnificent Stuffed Mushrooms as an adaptation of another family favorite, Yuck Mushroom Bruschetta Spread. My problem with the texture of mushrooms still lingers, but their contribution to the other dishes that I make is undeniable. Just like those amazing patent leather heels of mine that can elevate even jeans and an old t-shirt but still hurt my feet, I can’t deny the power of the mushroom. My stubbornness aside, I think I will incorporate them into more of my dishes provided that I can chop them small enough to pass undetected or leave them large enough to pick out. One way or another, Brooks might be able to dump his mushroom mistress for good, as soon as he pulls in our driveway next time. 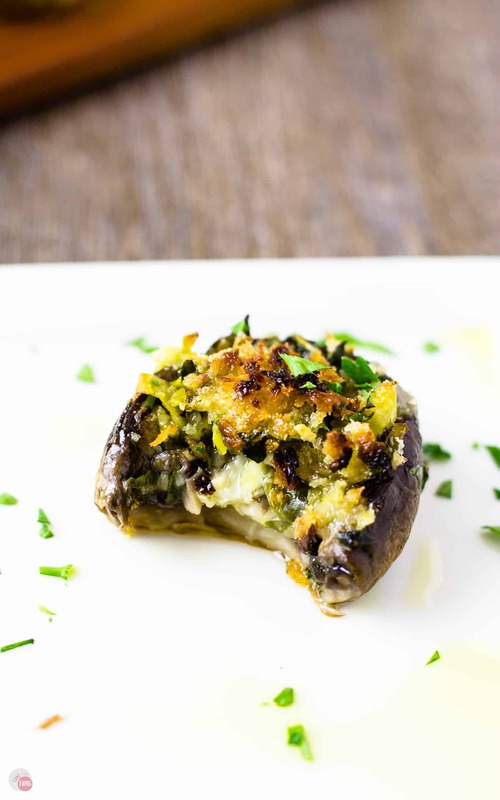 Whip up a batch of my Magnificent Stuffed Mushrooms and banish the mistress for good! Add olive oil to small saucepan. In a food processor, add the cilantro, garlic, and 1/2 the chopped shallot. Pulse until cilantro is thoroughly chopped and garlic and shallot are incorporated. You might need to add a teaspoon of olive oil to facilitate this process. Remove cilantro purée and add to saucepan with olive oil. Simmer on low for 10 minutes or until the oil is fragrant. Strain the oil and puree through a fine-mesh sieve for 5 minutes saving the oil and cilantro purée in separate containers. The oil can be stored in the refrigerator for up to a week and used just like plain olive oil in any other recipe. Lightly spray a foil-lined baking sheet with olive oil spray. While the cilantro oil is straining, gather the mushroom stems, red pepper, feta, pepperoncini, capers, remaining shallot, balsamic vinegar, panko, and spinach in a medium mixing bowl. Add the cilantro purée and 2 tablespoons cilantro oil to the stuffing mixture. Season the mushroom caps with salt and pepper. Stuff with the above mixture and top with a little of the parmesan cheese. Drizzle with cilantro oil and bake for 10-15 minutes depending on the size of your caps. Remove the stuffed mushrooms from the oven when done and let cool for a minute or two. 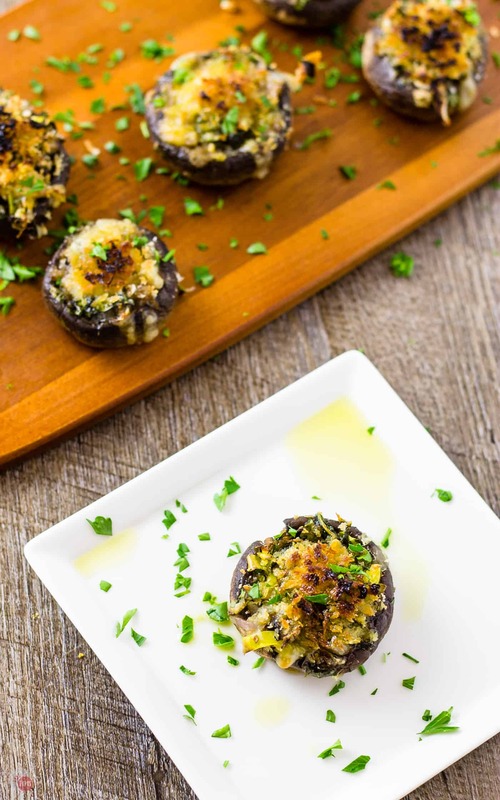 Add a drizzle of cilantro oil on your serving plate and top with the magnificent stuffed mushrooms. Enjoy! *This mixture is also great with pasta if you are not in the mood to stuff! I absolutely love mushrooms and this recipe sounds amazing. I can’t wait to make them! 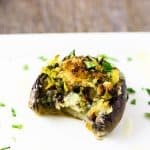 This has to be the ultimate stuffed mushroom recipe! These look so awesome! Fortunately (for me), I’m a huge mushroom fan, and I’ve just fallen in love with the flavors you’ve incorporated in here. Cilantro, roasted red peppers, capers, pepperoncini… YES, PLEASE!! And I’m also excited to try your mushroom bruschetta spread recipe… YUM!! Oh my! These sound like they are bursting with flavors!!! 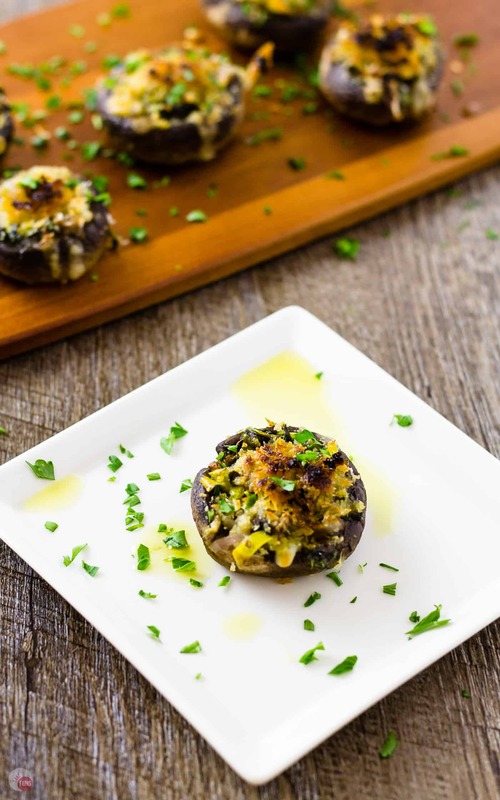 My family loves stuffed mushrooms but I’ve never made one like this! Cant wait to give it a try! I totally get the texture issues with food… I dont know why, I dont have an issue with mushrooms, but I dont. Although Im kind of snobby… the fancier, more expensive the more I like them. Go figure. (Like good shoes, you must pay for great quality!). Made this for a cocktail party appetizer last night.. They were amazing! My husband had so many I had to make a second batch! Ever feel like someone made a recipe just for you? That’s how I feel right now! These are perfect in every way!! I also have a love affair with shoes and my closet is slowly being overtaken by them! I also LOVE mushrooms and I could devour these, they sound divine!! They were definitely a hit!!! Will be trying this recipe for sure. Great pictures too. Thanks so much! Looking forward to collaborating with you on some recipes!